Jiden Armstrong has gone up against pirates, smugglers, traitors, and murderers but she has never faced anything like this. Her homeworld of Century is looking down the barrel of a gun and the people behind it have not hesitated to kill, manipulate, and destroy. To save Century, Jiden will have to build alliances with people she’s never met. She will need to fight battles both in the depths of space and face to face. There is a war coming, one where entire fleets, entire worlds, may burn. In that war, Jiden’s family and friends, the Militia she has come to love, could be corrupted or destroyed. That war may well just be the prelude to something far worse. To save her world, Jiden will have to dig deep, to find the things that truly matter to her. She will have to understand pieces about herself, to understand why it is that she fights. Because valor is in her blood and she doesn’t know how to quit, doesn’t know when to stop… and that may be all that saves not just Century, but all of humanity. “Shift geometry!” I shouted as the enemy dreadnought opened fire. It had fired at us with both its primary and secondary batteries and we had about three seconds warning. It had fired antimatter projectors, which were bad enough. Antimatter projectors fired a beam of antiprotons at high speed. When those hit the particles at the edge of a warp field, they caused massive detonations as matter and antimatter collided. The heavy disruptors, though, they were aimed pulses of the same exotic matter that made up a warp drive. A direct hit from one of those could destabilize a warp field or even punch through to strike the hull of a ship. As Alexander Karmazin shifted the variable geometry of the Alexandria’s drive field, I threw our ship in a corkscrew spin to try and avoid the inbound fire. Shifting our drive geometry to a wider one slowed our overall relative velocity, though, so I wasn’t able to get as much separation from where the enemy ship’s weapons fire went as I’d wanted. Our drive field caught several glancing hits from the antimatter projectors and at least one direct hit from the heavy disruptor cannons. For a ship the size of a destroyer, that should have been the end of us. The glancing hits from the antimatter projectors were in the fifty megaton range. The heavy disruptor cannon should have collapsed their field and probably would have shattered the ship itself. Instead, the field shuddered, slightly. My eyes widened as I saw that, but I didn’t have time to really think about it. I whipped the ship back around, sweeping in even as the dreadnought’s commander swept it up, trying to keep us at range. “We’re in range,” I snapped to Sashi Drien. She opened up with the Alexandria’s main battery. We’d already volleyed our warp missiles at the dreadnought’s escorts earlier in the battle. Unlike the dreadnought, we couldn’t mount full batteries in turrets. We had a single primary weapon system, a pulse laser on a phased array, to give us a broader field of fire. The pulse laser had an extremely short optimal range at only thirty thousand kilometers. At that range, the beam only took a tenth of a second to cross that distance. “Enemy firing!” I called, shifting us to evasive even as Alexander shifted our drive to compensate. We had far less time to react at this range and this time the enemy fire was far more accurate. The Alexandria shuddered under multiple impacts to the warp field and this time several of the disruptor beams penetrated. It didn’t go down, though, and while alarms wailed, the Alexandria held together. I filed that away, even as I brought the ship around for Sashi to engage. “Firing!” she called out. We’d dropped the range to under twenty thousand kilometers. Firing at that range, the Alexandria closed the distance in six hundredths of a second. At that range, the flash as the pulse laser struck the dreadnought’s warp field dead on, combined with the explosive failure of the drive, followed immediately by the dreadnought’s antimatter reactors overloading and detonating was painfully bright. For just a moment, the system had a second star as over five hundred megatons of energy released in a single instant. “Target destroyed,” Sashi noted, with unmistakable satisfaction. I was of a bit more mixed feelings as I terminated the simulation and sat back. The four of us sat in the basement room of my grandmother’s big, stone house. It shouldn’t have surprised me that she had rooms dedicated to running simulations in a secure environment, but it still had as she’d told me that she had some combat simulations she wanted me and my friends to go through. Captain Arthur Weisfeldt had delivered those sims, and Sashi Drien and I had installed them and the additional monitoring equipment that he’d wanted. “Did we just kill a dreadnought with a destroyer?” I asked, still feeling disconnected and a bit in shock. That wasn’t supposed to happen. Sure, a squadron or two of destroyers was at least somewhat believable, but a single ship? “Sorry?” I asked. Ashiri had been running the sim for us, less as the opposition and more as general oversight for the exercise itself. “Super-destroyer?” I asked, raising an eyebrow. “Well,” he smiled at me, “It’s bigger than a destroyer, smaller than a cruiser. There’s dreadnoughts and superdreadnoughts, why not a super-destroyer?” Any arguments I might have had for him sort of evaporated with that smile. It was so sincere, so earnest that my heart just sort of melted. “It’s currently in use, typically for ships smaller than a destroyer but larger than a corvette,” Alexander Karmazin’s protested. Leave it to him to argue a point, even with his girlfriend. “Which hasn’t been in use since ships were made of wood,” Kyle stepped up next to Alexander. The two of them were opposites in looks, Kyle was pale, freckled, and his bright red hair stood out, cut just inside miltary regulations, his green eyes twinkled merrily as he tweaked Sashi. I felt the need to speak up, mostly because I didn’t want this devolving into a days-long argument about terminolgy ranging from the historical to the fantastic and beyond. “It’s the Alexandria-class, it has no official designation of ship-type. How about we leave it at that, huh?” I didn’t really see why it mattered. It was roughly the size of a destroyer, that was good enough for me. I understood what that meant right off. She was going to make sure our future scenarios were harder. Not that I blamed her. We were supposed to train under difficult circumstances. Kyle and Alexander shot one another looks and I caught that, pausing before I stepped out. Apparently Sashi was going to try to slip in her naming convention. I should have known they wouldn’t let it go. I had to hide a smile as I ducked out of the room. Apparently Kyle and Alexander had allies in that particular fight. The Admiral led the way down the hall. We were in the basement of her big stone house, so it was surprisingly cool in the hallway. “Honestly, I’m not sure I believe what we did, ma’am,” I said to her quietly as we walked towards her “secure” office down the hall. “That’s part of why we’re going to tweak the software. Everything matches up to the design capabilities, but those capabilities may prove… optimistic. So we’re going to dial things down a bit,” The Admiral answered dryly. We stepped into her secondary office, this one was remarkably bare, with just a desk and secure terminal, a couple of chairs, and several secure file cabinets. “Besides, I’m reasonably certain if I tell the Charter Council that a group of cadets in a single ship took out a dreadnought and it’s escorts in our trial scenarios, they’d assume I’d tweaked the results. If we give them something more along the lines of what they’d expect, they’re more likely to approve the further expenses of more Alexandrai-class vessels.” She took a seat behind the terminal and gestured at the other chair. “More of them, ma’am?” I asked in surprise, taking my seat. “Oh, I assure you, Jiden,” The Admiral quirked a smile, “these ships are far, far more expensive than you might even guess. But any expense is far less than losing our planet. It’s a rather barren, hot, dusty place, Century, but it seems so very many people have wanted to take it over the years. We’ve had to fight so many battles defending it.” Her voice took on an odd, sad note as she said that and I wondered if she was thinking of my grandfather, her husband, who’d died defending Century long before I was born. I shivered at that. In part, it was a response to the huge fleet that had arrived in orbit over my homeworld. They’d emerged from strategic warp so close to the planet that they’d been visible to the naked eye: almost a hundred ships in total. If not for the Admiral having a huge portion of our reserve forces activated on extremely short notice, then we would have had almost nothing in position to stop them. Of course, the other part of that shiver was for what I’d found in that network, what I’d found running that network. It had been a copy of my gestalt, an intelligence based upon my mind, but stored in the network, selected by the late Doctor Aisling and used by Charterer Beckman. I still didn’t know why they’d used a digital copy of me for that task. Maybe it had amused Aisling or maybe Charterer Beckman had wanted a way to tie things back to the Admiral if things had gone wrong for her. My digital copy had been my opposite in many ways, though. She hadn’t cared all that much about defending Century, about saving me or my friends. She’d only cared about her own survival and I’d had to make a bargain with her before she’d helped me: in return for me keeping quiet about her, she’d given me information that had helped me to stop Charterer Beckman’s plan. I couldn’t tell the Admiral that second part, of course, and I kept wondering just how much damage the rogue copy of me was going to do, out there in the planetary network. I just really hoped it wouldn’t turn out to have been a bad bargain. But I still didn’t feel it was right to betray her trust. Charter Beckman’s contact with Crown Prince Abrasax had been a pirate by the name of Wessek. From what we’d learned, Wessek had been ordered to attack my home, at Black Mesa Outpost. His goal there had been to either kill or kidnap the Admiral, me, and my entire family. He’d killed my parents for fighting back and kidnapped my little brother. “We’re expecting our consulate from Drakkus to evacuate, the new President sent orders to that effect, anyway,” the Admiral said. “When they do, and when some of our agents on Drakkus get the opportunity to report in, hopefully we’ll get more news on Will.” I knew she wasn’t telling me everything, but I couldn’t blame her. The world of intelligence gathering was murky. I hadn’t gone into that track and in reality, I didn’t want to be involved in that kind of thing. My life was hard enough as it was, I liked to face my problems head on. My eyebrows went up that that. The Admiral hadn’t even told me when she was stepping down from overseeing the Academy. Somehow I had a bad feeling that any news big enough for her to tell me in person had the chance of overturning my entire world. I straightened in my chair, feeling as if my heart was going to explode out of my chest. All my confusion, all my fears were banished by her words. She trusted me to help defend Century in her absence. She really trusts me. Somehow, that thought made everything seem better. I am excited to announced that Valor’s Stand, the fifh and final book of the Children of Valor series, will be coming soon. I am aiming for the 29th of March, and as long as the edits, cover, and feedback all line up, you should see it at the end of the month. Check back here tomorrow for the first snippet. Like many people, I’m sure, I’ve been buried with advertisements and tons of social media commentary about Captain Marvel. Some people are gushing because “squee female hero” and others are screaming it’ll be horrible and the advertisements make it look dumb. Political commentary by talking heads and actors aside… well, it’s a Marvel movie, so I figured I’d want to see it anyway… despite all the hype, advertisements, and stupid crap people are saying about the movie. And I’m glad I did. It’s first and foremost, a Marvel movie. It follows the same formula of their origin story movies and it does it fairly well. Despite what hype might say, it’s not all that groundbreaking. The CGI is great, the action is solid, the humor is there to highlight and accentuate, but isn’t the main theme of the movie. It’s a movie about a hero finding herself. It’s also one of the strongest heroes we’ve seen so far, with the power equivalent to (or maybe even exceeding) DC’s Superman. There’s challenges that come with telling a story of a hero that powerful, and by and large, the writers pull it off. We get to see Captain Marvel being strong and smashing stuff, but also trying to figure things out and learn who she really is. We also get to see normal (or at least, merely mortal) humans taking on aliens who are far out of their league and it was pretty refreshing. There’s lots of scenes in a variety of these movies of awesome heroes taking on superhuman threats and looking cool while doing it, there’s far fewer of regular people standing up to those threats with nothing more than bravery and their own cleverness. They did a good job with that in this one. There were a few twists and turns with the story, many of them are foreshadowed heavily enough that you can sort of see them coming, but there’s a couple things done for humor that are pretty well set up. 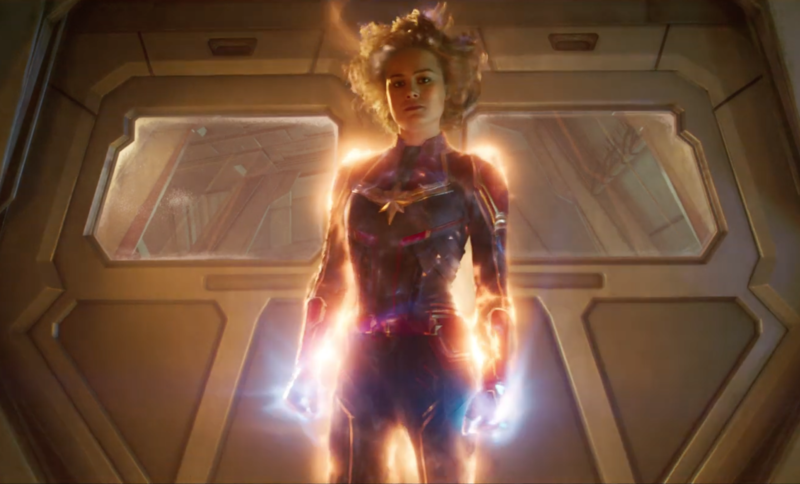 For as awesomely powerful Marvel is, I wish they showed her struggling with controlling her power a bit more, especially around us fragile humans. The setting is mostly believable, though they laid some things on a bit thick. I think the messaging was a little too ham-handed in parts, I’m not sure if that was the way certain villains were portrayed or just that they didn’t take the time to explain more of the background. The ending was a bit rushed, too, but I’m not sure how the movie could have ended much differently given the setup. It’s not my favorite Marvel movie, but it’s got it’s moments and there are a couple of great scenes. Could it stand on its own? Now that I couldn’t say. Captain Marvel doesn’t have the same emotional grab to as broad an audience as other Marvel characters. Iron Man started the franchise with a complex character with numerous flaws, a talented, brilliant, selfish, arrogant man who had lots of room to grow. He was a character with his own inner demons to face and a story of arrogance and personal failures that basically drove the plot of the movies all the way up through the first Avengers. Captain Marvel has power, but I don’t think she has that same resonance… or maybe I’m just not the target audience for that resonance. She’s strong, she’s confident, but she’s too perfect. She doesn’t have those flaws that mere humans can see as reflections of their own. Her moments of awesome in the movie were cool… but there was never a moment where I felt I really resonated with the character. Some of the side characters, absolutely. There’s a side character who was far more dynamic and whose heroism (for the relatively short screen time she had) was fantastic. I found myself wanting to see more of her than the main character. Overall, it was fun. There was plenty of dramatic tension to the fight scenes. There were high stakes and the movie answered questions about the universe and opened up a whole new range of other ones. Oddly enough, they’ve set themselves up for sequels to a prequel without really spoiling too much. I enjoyed it, despite all the hype. If you’re on the fence, I recommend seeing it for yourself. Take what you’ve heard with a grain of salt and just see the movie. 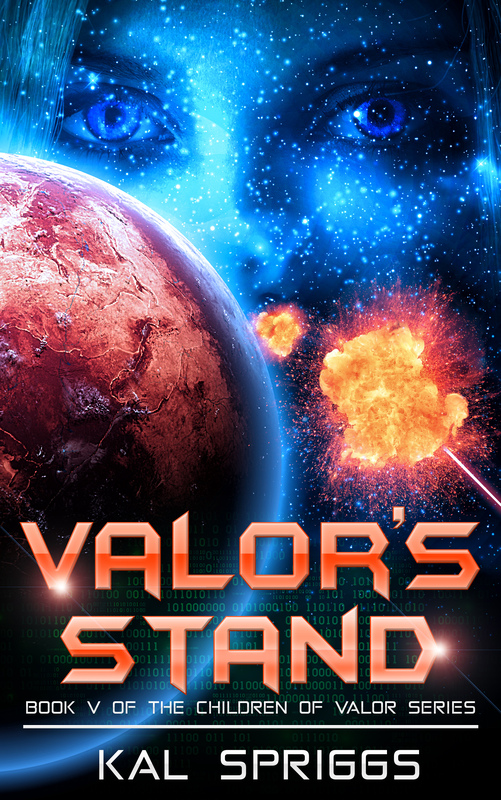 Valor’s Stand, the fifth and final book of the Children of Valor series is done and will be coming this month to Amazon. Additionally, the narrator has started on the second book of the series, the first one, Valor’s Child, should come to Amazon & Audible.com as an audiobook in the next few days (if it’s not up already). This is going to be a busy writing month for me and I’m going to be doing my best to get ahead and get more books in the pipeline and ready to go. So look back here for updates and thanks for reading!